Here we are at the flight field getting the battery hooked up and ready for flight. The battery takes a while to charge and it’s going to give you about a six minute total flight time, so around the five minute mark you need to start thinking about landing the aircraft soon. The Sensei FS flew VERY WELL – better than any other trainer that I have flown before and I think the WISE Stability Control system plays a major role in this! The plane took off effortlessly without me providing any controls other than some throttle. Once in the air, it banked really wide, slow, and easily. It felt some what like a glider in the way that it was slow in movements but you still had the power of the brushless motor for when you needed to give it some throttle. The intermediate mode gave me just enough control that I felt like it wasn’t flying on its own anymore! (haha) Then the expert mode allowed full control without the WISE helping out at all. So this aircraft, while aimed at complete beginners, could still be a fun plane to fly if you have haven’t flown in a few years and are looking for a good airplane to brush up on your skills. You can easily go from beginner, to intermediate, and then on to advance once you get the hang of it again. The drop-door was a lot of fun as well, which I unfortunately did not capture on the video but my son had an army parachute that we dropped from the sky which made it a lot of fun for him and my daughter who didn’t get a chance to fly the plane. The landing of the Sensei FS in beginner mode was a bit awkward because you had to force the plane down. 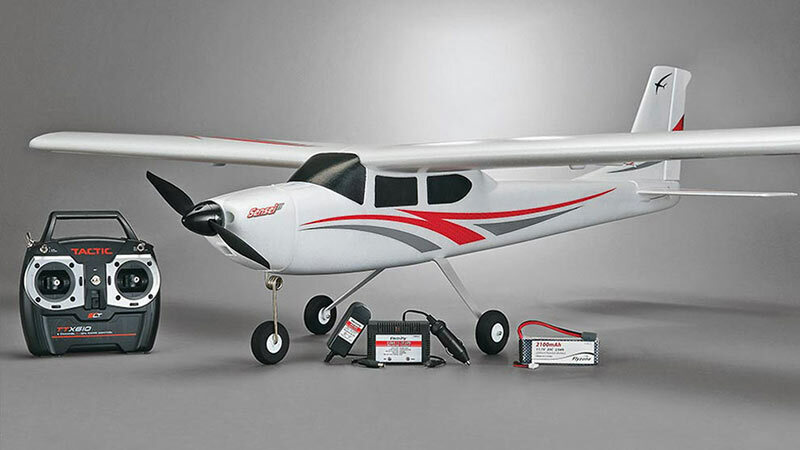 Typically with RC planes, when you let off enough on the throttle the airplane begins to go down but with the Sensei FS, you must apply a bit of down elevator to get it on the ground. This is actually a really good thing because the up elevator keeps the plane in the air, keeps it stable, and makes it easy to bank without giving extra up elevator. Again, the landing is the only odd piece to it. Lastly, I wanted to make a note about the landing gear that is maneuverable with the rudder control. This came in handy more than once, when taxiing on the runway and off the runway. Kudos to Flyzone for providing this functionality in a trainer! Read on to the next page for our conclusion and final thoughts of this R/C Plane!